It is not too often that I get to write about a food item where my only complaint is the bag is not big enough. 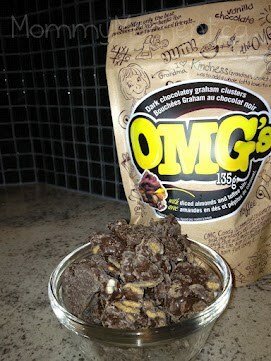 OMG’s are the latest creation by Chris and Larry from Winnipeg and these are the best chocolate candy I have ever tasted. Yes, I said it…The Best! Let me give you a description of these chocolaty pieces of heaven. First they start with pieces of graham crackers and mix in almonds and toffee pieces. Then they are coated in either milk or dark chocolate. Not overly sweet, they are the perfect combination that just keeps you wanting more. It is very evident that these nuggets of goodness are made of very high quality ingredients. While these candies are very new to the market (only hit the shelves THIS MONTH) they are available at select stores. Check omgs.ca for further details. I would rest assured that if you do not have one of these stores in your area, be patient. With how good OMG’s are, I’m sure it is only a matter of time before they come to a story near you. Also to get more background about these guy’s check out their pitch to the Dragons on the show Dragons Den. I’m so glad Arlene Dickinson offered them a deal! These candies are like gold and I would not hesitate to buy them, in fact, I need to keep myself from going overboard and purchasing all the bags on the shelf. So please go out and get some for yourself and join the revelation that is coming to a candy isle near you. Please be patient – Rafflecopter (the entry form) may take a moment to load. Walmart in Ontario would be handy. I would love to see them in Walmart in Manitoba. I’m so glad they are being carried in Superstore but would also love for Wal-Mart to carry them as I do a lot of shopping there too! I live in Winnipeg so it’s nice to see another product from this hometown duo! Way to go Chris and Larry!!! Costco in Alberta would be AMAZING! I was going to say Loblaws/Real Canadian Superstore but I see they are already carrying them. The other store I frequent is ValuMart in Ontario. Walmart Canada – Mississauga, Ontario. I’d love to see them carried in BC at any store, except Wal-Mart cause I won’t step foot in there! OMG’s are amazing. My kids couldn’t get enough. Safeway in Alberta would be great. Would lovre to see it at Stop & Shop. Would love to see the Extra Foods in Sechelt British Columbia carry them! metro or loblaws in ontario, or walmart. basically anywhere i can get it easily! Anywhere in Penticton, BC would be nice! Shoppers Drug Mart stores in Manitoba please!! These sound heavenly!! Shoppers Drug Mart in Ontario would be a good fit for OMG candy. I would like to see them carried at walmart. Walmart in Alberta would be great. Walmart in Apopka and Orlando, Fl. I would love to see the product in Metro, Ontario. I would like to see Pharma Plus in Ontario carry this product. I wouldn’t care what store, if they are that good I would drive there if they are in Alberta and close to Edmonton. Any Wal Mart, candy store, Save On foods would be great:) Sound delsish! I would love to see it in walmart in upstate ny.. I would love to see them in Walmart in NL! Loblaws in Toronto – please! I would like to see OMG’s for sale at Costco, Safeway or Superstore in Manitoba. Sobeys in Alberta would be nice. I haven’t seen them and I’m a regular in the chocolate and candy aisle. I would love to see them in United State. Safeway or Costco in Alberta! Real Canadian Superstore in Alberta! I would love to see them in Canada Safeways, or Walmarts, in BC or SK. I’d like to be able to buy these at Superstore here in Oshawa. I would love to see Wal-Mart or Target sell this item. I would love to see them at the Real Canadian Superstore or Wal-Mart in Ontario. I would love to see them in Espanola, Ontario at YIG (Your Independent Grocer) which is a division of Loblaws. That is where I shop primarily. I would love to see them at Superstore in Calgary, Alberta! I think that Superstore or Walmart in Alberta! That would be awesome! Real Canadian Superstore in BC……please!! I would like to see it in Fortino’s in Ontario!! I think London Drugs in Manitoba would be a great place! I’d like to see them being sold at Dominion in Newfoundland. i would love to see them in Ontario!! I’d love to see them in Costco. Thanks. I I would love to see them in Pete’s in Nova Scotia. Save on Foods in BC. Shoppers drug mart in Ontario! Looks so yummy and I think I saw it in the Dragon’s Den, the two men that created this also created poppycock? I would like to see Walmart in Saskatchewan carry OMG’s Candy. I’d love to see Askews in BC carry OMG’s candy. I would like to see OMG’s Candy carried in Sobeys stores in NB. Wal Mart in Manitoba would be nice to be able to buy these. I can go to Shoppers’ and Superstore though. Think my hubby would love these, as he loves Clodhoppers! Hi there. These sound so yummy. Well I would love to see them in my shoppers drug Mart in Ontario – London – or in the Real Canadian Superstore. I would love to see OMG Candy at Walmarts in Alberta. I saw this on Dragons Den. Would love to see them in all major grocery stores. Shoppers or London Drugs would be a great place. every store!!! At least Wal-Mart haha, but they look so OMG good! Superstore, Walmart or Shopper’s… those are the places that I go to the most! I’d love to be able to buy this at Zehr’s in Ontario. I also saw the product on Dragon’s Den and would like to see them available in major grocery chains. Any major BC grocery store, Save On, Superstore, Shoppers Drug Mart, Walmart. I would love to see Super store in BC sell these! !